The last Camaro Z/28? Chevy teased buyers but 1974 was not the end for Z/28s. Camaro Z/28 racing in the weeds. You can tell me the truth. I can handle it. The cold harsh reality is that my favorite cars, 1970s Camaros and Firebirds, were really not built very well. Quality control went the wayside in favor of frugal economics. Sales dictated the cars get out the door as quickly as possible. Enthusiasts would not even stop buying them long enough for the engineers to redesign some of the major flaws in these cars. The doors were too heavy. They would not handle in the rain, resulting in many being wrapped around telephone poles, yeah, yeah, yeah. But I love them! I would live in second generation F-body-land if there were such a place. 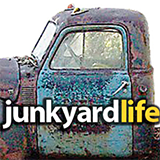 Some may say I already do – with a cavalcade of Camaro and Firebird parts residing in my basement. These cars are a huge part of my life and I could not resist taking a few shots of this 1974 Z/28 lawn ornament. The 1974 Camaro Z/28 emblem is really colorful and bold. 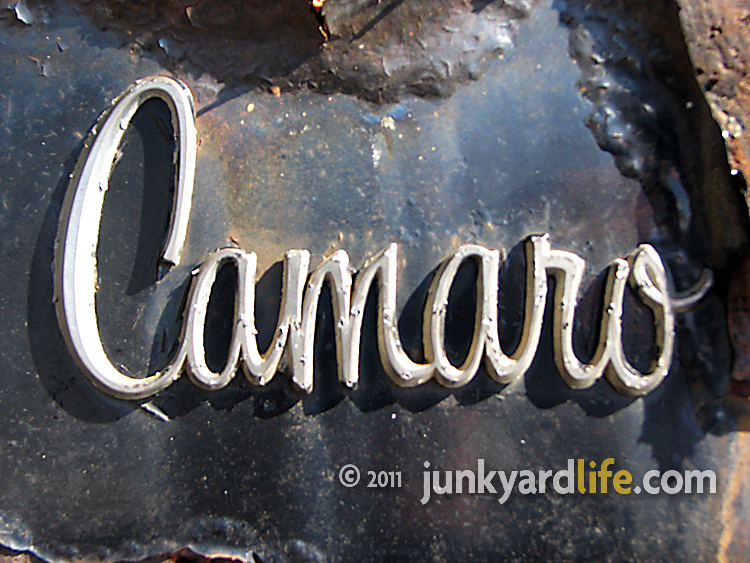 Many thought 1974 model Camaros would be the last hooray for the Z/28. Why? Because Chevrolet told us so. Blaming poor sales, increasing insurance rates and tougher government crash standards all but eliminating muscle cars. GM decide to discontinue the Z/28 performance option for the 1975 Camaro. Buyers in-the-know scurried to dealers to order what they thought were one of the last Z/28s, the '74 models, with beefy suspensions, thick rear sway bars and more often than not, a positraction rear end. I love factory tachometers. 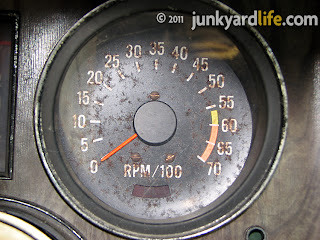 Ordering a 1974 Camaro Z/28 got you rally gauges. In other models it had to be specified. The '74 Z/28 Tach may have read 7,000, but don’t do it! It's not a DZ car, you know. So it ended there, sort of. In 1975 you could virtually get a Z/28 in the Camaro’s LT or Rally Sport package, but without the Z/28 name. '75 models could be optioned with 350 4-barrel engines and 4-speeds. They had positraction rear ends and the famous F-41 sport suspension. Good for getting them off the line and around corners in a hurry (as long as it was dry), but they did not declare Z/28 anywhere on them. Last trivial factoid, then on to the feature car I am dreaming about this month. In 1977, Chevrolet released a “limited number” of Z/28s and said, “We won’t build many, so if you want to move 'Z' style, you better get moving.” Then in 1978 and 1979 they sold as many Z/28s as they could get off the assembly line. So if you bought one in 1977 thinking that would for sure be the last one… gotcha! 1974 was the first year the Camaro got aluminum bumpers. They didn’t go over well at the time because people loved the clean chrome look of the 1970-73 models, the split bumpers especially. But, I think I like them. Before you throw tomatoes at me, remember that being of driving age in the eighties, the later second generation cars were more obtainable than the earlier split bumper cars. So naturally, I had more experiences with them. This Z/28 is a black on black automatic car. 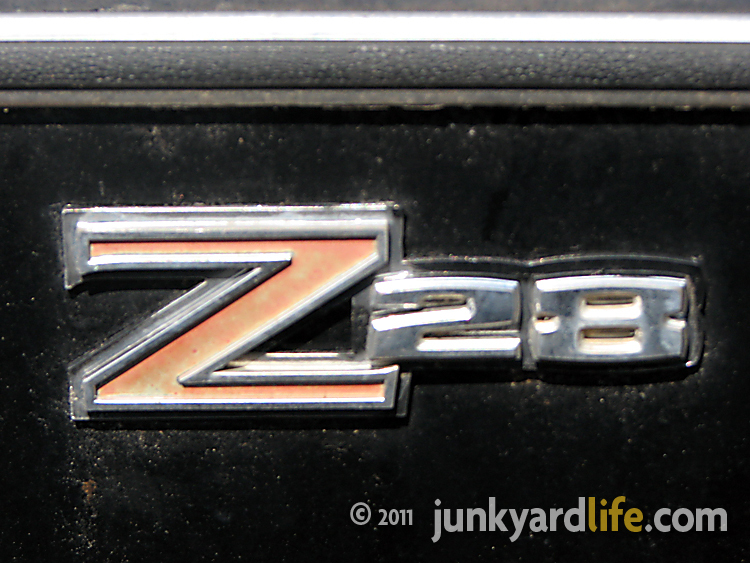 I could make out the cowl tag enough to declare it to be a real Z/28, but not enough to verify the original colors. I am inclined to believe it was a factory black car due to the door jams and no signs of a color change under the hood. This one had the beefy sway bar and the cool gauge package that I have always been attracted to. The original engine was long gone, having been replaced with a standard looking 2-barrel small block. The owner said it had an Oldsmobile rear end. I have no idea what he meant by that, because it does not. 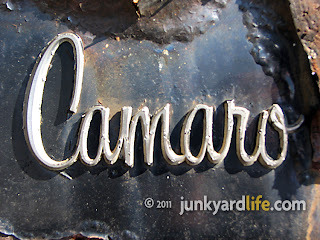 I love the choice of script Chevrolet used on the early Camaros. It is rather friendly. So if it was mine… I would have to go back to the original black (code 19) paint and get the bold silver Z/28 stripes that came with the appearance package that year. Style points for the three fat stripes leading to large “Z/28" lettering smack dab in the center of the hood. I also love the fender emblems from that era, so I would keep them. For power, a Z/28 deserves a lot of it, I would have to declare a hot small block with a lumpy cam and a deep, deep tone exhaust. My '74 Z/28 would fall somewhere between fire breathing dragon and restoration. How could that not be fun? I am afraid the collector value of these cars may be starting to rise, so get them while you can. Alright, fellow earth roamers, I think I will get back to lusting over these Camaro restoration catalogs. Happy hunting! YOu should save it , black was not a std color in 74, you had to special order it, trim tag won't have the code , it willhave --- dashes where the color code normally is.. The Decal pkg, were not painted but vinyl . The 74 was the last year a 4 bolt main HD block with large valve heads ever in a Z28...the M21 alum casedHD trans mssions were not available in 75 . 1975 had the poor saginaw 4 spd. 74 was the last year of the good looking rear window. And the 74 Z was the first GM car with HEI .at midyear. So my 1975 Camero says LT on the steering wheel, but no Z28 anywhere in the car. Is it safe to say LT is the same as a Z28? Sorry, no Z-28 option available in the 1975-1976 models years.